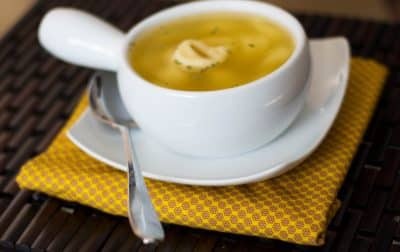 This recipe for Tortellini en Brodo was that recipe for me when I was a new home cook living on my own. I don’t know why it intimidated me, I was making far more difficult meals than this at the age of 18, but after realizing that ‘en brodo’ simply meant ‘in broth’ I finally looked at the recipe and LAUGHED! It was so SIMPLE with only 2 ingredients. Now my kids love it when they just want something hot to sooth their throat when they have a cold. 1. Bring the chicken broth to a boil in a medium saucepan; then add in the frozen tortellini. 2. Allow to simmer until the tortellini is cooked through, about 10 minutes. Season with salt and pepper and garnish with parsley. Makes 4 cups. How funny-the title made me think it was complicated, too! I bet my kids would love this on a cold day.